The divers must ensure all the inhabitants on the Giant Ocean Tank are getting enough to eat. With more than 1,200 fish and many different body shapes, eating styles, and eating locations, making sure everyone is fed is a lot easier said than done. A method we use in the GOT is to target train individuals. Target training involves teaching a fish (or turtle) that a certain object, sound, place, etc. (a.k.a. the target) means food for them! It helps isolate them from others who might be faster or more eager for food. The process is dynamic but follows the same general outline: 1) introduce the target while offering food in close proximity, 2) try to strengthen the association by getting the individual to eat inside the target, 3) maintain a high comfort level with the target by only feeding when the target is present. 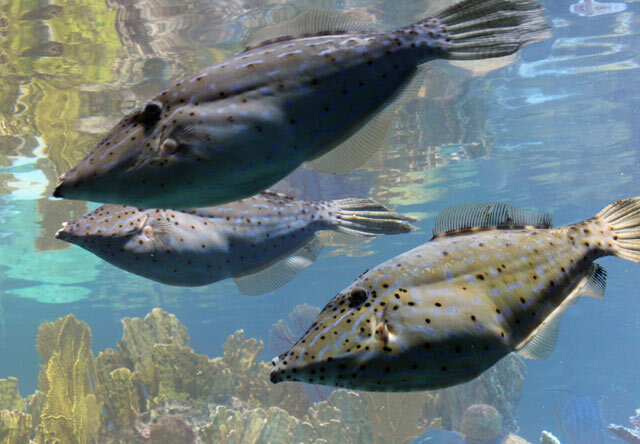 Three filefish patrol the Giant Ocean Tank. 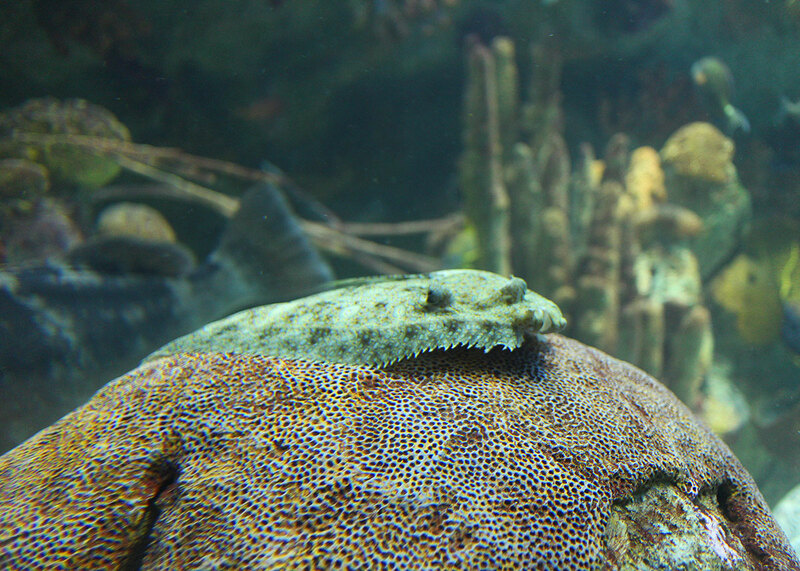 A peacock flounder rests on a knob of coral in the Giant Ocean Tank. Even though there are only three general steps, there are almost always brainstorming sessions, adjustments, and redesigns that need to be made before we figure out a solution that is both simple and effective. In rare cases we have to scrap the entire attempt because the fish is smarter than we are, as was the case with our peacock flounders. But when the GOT residents aren’t outsmarting us, they will swim right into their target, protected from more aggressive species. Check out this video that shows the targets in action for our boxfishes, filefishes, and jackknife fishes.